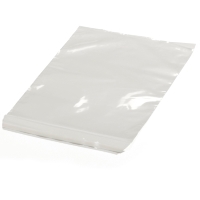 TopTac is a lightweight, crystal-clear envelope, so you can see its contents in all their glory! TopTac is therefore immediately far more than just a cover that protects the contents. TopTac gives you the greatest possible assurance that your message will be both seen and read. TopTac literally gives extra impact and transparency to your mailing! Even better you can save considerable amounts of money on postage costs due to the light weight design TopTac envelopes are extremely strong and fitted with an easy to use peel and seal strip. The contents will always be kept dry as TopTac envelopes will withstand the rain and self-adhesive labels stick to it perfectly. We can of course also print them for you. TopTac is exceptionally suitable for mailing promotional material, magazines, brochures, leaflets, catalogues and other important information in eye-catching packaging which immediately demands attention.